Utah, a state generally capable in the criminal justice world, is now on the precipice of costing taxpayers 500-525 million dollars by building a new prison to ease the overcrowding, and in anticipation of rising incarceration rates. 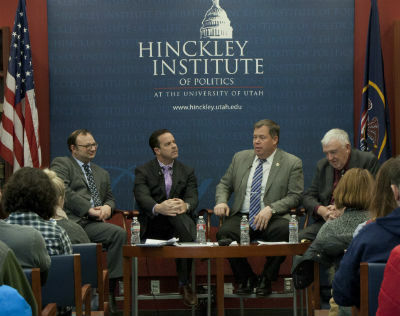 Former Texas State Representative Jerry Madden, a signatory of Right on Crime, and Marc Levin, the Director, both joined a Hinckley Institute panel last week to advocate for cost-efficient measures that focused the limited resources of the state on high-risk and violent offenders. These measures would include strengthening the parole and probation programs in order to allow low-risk and nonviolent offenders to be diverted to these inexpensive alternatives. “Ultimately, I think the vast majority of folks would say let’s reserve prisons for those people we’re afraid of, not those we’re mad at, and recognize the fact that people can actually get worse in prison,” Levin said. “Really, the results speak for themselves,” Levin added. While in Utah, Levin and Madden visited with Derek Monson of the Sutherland Institute for a discussion about criminal justice reform efforts in the state.